The giant-leaved fig is a widely distributed species. It occurs naturally in South Africa, Mozambique and Zimbabwe, into tropical and west Africa, as well as in Madagascar, the Comoros and Seychelles. It is a commonly cultivated species and has become naturalized in areas previously outside its distribution range. The habitats in which it occurs are varied, ranging from coastal and riverine forest to evergreen forest and woodland. The species is seen to occur from sea level to 1 000 m and, in some areas up to 1 800 m above sea level thus representing a notable altitudinal range. It tends to thrive in the warm, moist and frost-free areas within its range, and under such conditions can be a very fast grower indeed. 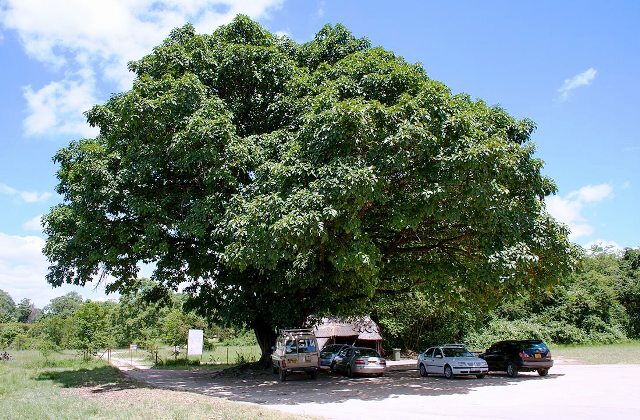 Giant leaved fig is a large, briefly-deciduous tree, capable of growing to 25 m in height. Its large, spreading crown can span 30 to 45 m in width. This spreading habit coupled with an often short and buttressed trunk can help in revealing the tree’s identity from a distance. Under forest conditions, however, it tends towards a taller growth habit with a somewhat narrower spread. The species also has the ability to become a strangler and is often encountered assuming this habit. The bark is relatively smooth-textured and dark grey to brown in colour. Branches may be finely hairy when young, becoming smooth with age. The lovely smooth, glossy leaves are very large in size, as the common name would suggest, and are quite distinctive, ranging from 130 to 430 mm in length and up to 200 mm in width. They are held towards the ends of the branches, are ovate to elliptic or obovate, and exhibit clear yellow veining. The attractive bronze stipules effectively sheath the terminal buds. The leaf margins are entire and the stout leaf stalks measure from 25 to 150 mm in length. The syconia (‘fruits’), borne most often between June and October, are crowded towards the ends of the branchlets in the leaf axils or below the leaves. They measure 15 to 30 mm in diameter, are sessile and are densely hairy to smooth. The fruits are eaten by local people. These are, however, not sold in market. The bark is used by villagers for making a twine. In Mozambique, a the fibe from bark is used for making a cloth. The latex is used for bird lime. The giant-leaved fig is well known for its horticultural value and is cultivated in various regions in Africa. In the wetter, warm eastern parts of South Africa, it is a popular street tree and is a common feature in parks and other urban open spaces. Its use in horticulture has attached to it some economic value also, as is evident in the nursery trade. In West Africa the fruits are known to be consumed by people, and in Angola the wood of the tree is used for the making of bowls (Burrows & Burrows 2003). The trees of giant leaved figs are planted in streets and gardens. It is, however, not planted commercially in orchards. 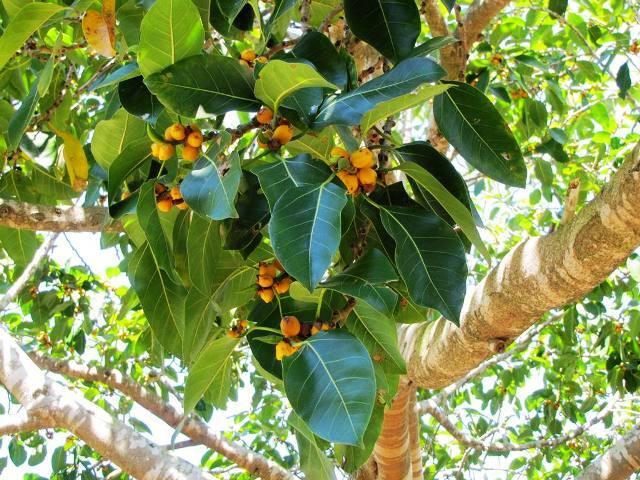 New plants of this tree can be raised from seed and cuttings. It is a fast growing species. The young plants should be planted in a large hole. Add a generous amount of compost and water regularly until well established. Whether planted for its wonderful aesthetic, functional or ecological value or fruits, this beautiful and majestic fig is sure to add a special kind of magic go your land.